Faithfulness to the Master: Part 2 (Luke 12:45-48) | Joe Quatrone, Jr.
Posted on April 29, 2015	by Pastor Joe Quatrone, Jr. Previously, we looked at the marks of a good servant. Today, we will consider the mistakes of a bad servant. If Jesus came today, what kind of servant would He find you to be? In the parable, there was another servant who was left in charge to manage some of the Master’s resources, but he makes a terrible miscalculation. In verse 45, the servant says, “My master is taking a long time in coming.” Sometimes Christian servants make the same mistake as well. They act as if Jesus isn’t returning soon. A true servant cares about the needs and feelings of others, but a bad servant thinks only about himself. There are some people who go through life leaving a trail of bloody relationships behind them. They make bad decisions and it ends up hurting many other folks. If you believe Jesus could return at any moment, you will treat others with kindness. But if you think He’s not coming back, you won’t have the same regard and care for others. Verse 45 says the bad servant ate, drank, and even got drunk. Now, there’s nothing wrong with eating, but the word here infers that he overate. He was a glutton. He had no personal discipline and no self-control. He abused his body by overeating and getting drunk. It’s a sad picture of a lazy, undisciplined servant who does things harmful to his own body. Sometimes, you’ll hear someone say something brilliant like, “Well, it’s my body. I can do with it what I desire! If I want to do drugs or get drunk that’s MY choice because it’s MY body!” Wrong. If you claim to be a Christian, your body belongs to God. Paul wrote, “Don’t you know that your body is a temple of the Holy Spirit, which is in you? You are not your own, you were bought at a price. Therefore, honor God with your body” (1 Corinthians 6:19-20). Just picture that lazy, abusive servant sitting around drunk, having a great time. Suddenly and unexpectedly the Master returns. What a shock! Look at verse 46. Jesus said the Master would take immediate action. He would “cut him to pieces and assign him a place with the unbelievers.” A lot of people who claim to know Jesus and claim to be His servant are really deceiving themselves. Even though they have a job within the Master’s house, their behavior gives them away. They aren’t true servants or true believers. They think everything is fine, until it’s time for a true accounting. There will be a payday–someday. You may be cruising along in your life thinking everything is fine, but one day the Expert Accountant will judge every one of us. You may be able to fool people, but you can’t fool God. You will be held accountable before God. Are you incredibly nervous about facing a Holy God who does not tolerate sin, but is full of mercy and forgiveness? Jesus said the servant who had been informed of the Master’s will and refused to obey would be beaten with many blows. The principle is simple: the more truth you have been exposed to the greater your responsibility to obey that truth. b) Ignorance is No Excuse! Suppose you are stopped by a policeman and informed you were going 55 in a 25 mph zone. You could say, “But officer, I didn’t know this was a 25 mph speed zone, I never saw the sign.” Is he going to say, “Oh, then that’s okay, no problem, just take it easy?” Don’t bet on it. 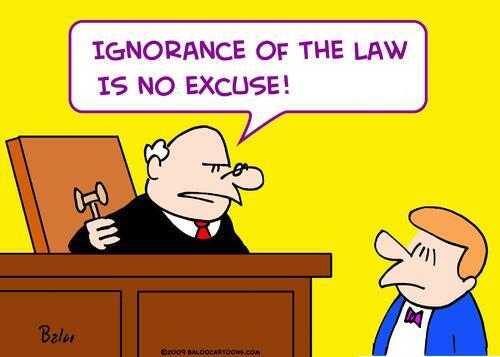 He’ll more likely say, “Ignorance of the law is no excuse.” God is the same way. Here’s His message to you today: the more you’ve been given the more God expects of you! You’ve been blessed with the truth of God’s Word, so He expects you to obey. God has given you many opportunities to follow Him. Are you being obedient to the truth you’ve received? Are you ready for Jesus to return? This entry was posted in Book of Luke and tagged Disobedience, False Teachers, Hell, Ignorance, Punish, Responsibility, Second Coming of Christ, Selfish, Sin. Bookmark the permalink. Pingback: Faithfulness to the Master (Luke 12:40-48) | Joe Quatrone, Jr.